The Cocoa Corner: Is Choc Finger Down $150 Million? In a front page story on Sunday, the New York Times suggests that commodity investor Anthony Ward may be trying to corner the cocoa market. Ward–known as Choc Finger–reportedly purchased 241,000 tons of cocoa, about 7% of the world’s annual crop. The price tag? A cool $1 billion. His play has some people up in arms. While some see it as a simple bet that cocoa prices will rise on falling supply, others say Mr. Ward has created a shortage of cocoa simply to drive up the price himself. … The fear is that Mr. Ward will become the go-to source until the annual cocoa harvest, which starts in October. With candy makers starting to stock up for the holiday season, they may be forced to pay him ever-higher prices — and cocoa has already jumped 150 percent since 2008. “The squeeze was really timed perfectly,” said Eugen Weinberg, an analyst at Commerzbank in Frankfurt. If Choc Finger’s game is to profit from future price increases, he’s sitting on $150 million in unrealized losses. Not a sweet outcome. Press is reporting the “biggest cocoa trade in fourteen years”, but it’s not that special. Back 2002 the same cacao king Anthony Ward bought 202.000 tons, just a little less compared to the current 241.000. At the time his purchase represented 5% of the world market. He made 40 million in 2002 on the trade. Three years ago Ward was quoted as the chocolate guru : “The world’s not going to run out of cocoa, but they’ll have to pay more to get the right beans”. Most press reports refer to the biggest cocoa trade in fourteen years, but haven’t done any more research. The large cocoa trade in 1996 was done by the firm Phibro, amounting 300.000 tons. In charge of the cocoa desk at the time at Phibro, was nobody else than the same Anthony Ward. Phibro lost money on this cocoa trade by the way, and was forced to unwind their positions. What’s the Best Voting System? Why? Because it eliminates the downside of voting for a third-party candidate. In a race between D and R, you may worry that voting for third-party candidate I is “throwing your vote away.” That worry disappears with IRV. You can give I your number one vote and either D or R your number 2 vote. If I loses in the first round, you’ll be disappointed. But you won’t have wasted your vote since your second-place vote now becomes operative. I think that would be a substantial improvement over the winner-take-all vote tallying that dominates the American political system today. But would it be the best of all possible voting systems? As best I can tell, however, both sides agree that the current system is flawed. For example, many of the IRV detractors believe we should adopt a different system: range voting, which allows voters to express how much they like or dislike a candidate. Rather than just ranking Oscar movies, for example, voters would award scores: (e.g., Hurt Locker 10 points, Up in the Air 9 points, Avatar 2 points). The movie with the highest score would win. Mathematics can suggest what approaches are worth trying, but it can’t reveal what will suit a particular place, and best deliver what we want from a democratic voting system: to create a government that feels legitimate to people—to reconcile people to being governed, and give them reason to feel that, win or lose (especially lose), the game is fair. The novelty of range and approval voting in modern politics is so great that we can’t know how they’ll work out without running experiments. Let me second that recommendation: more experiments with IRV, range voting, approval voting, and other innovations would be well worth the effort. Yesterday’s housing data were suitably glum, with single-family starts and permits both down (0.7% and 3.4%, respectively). 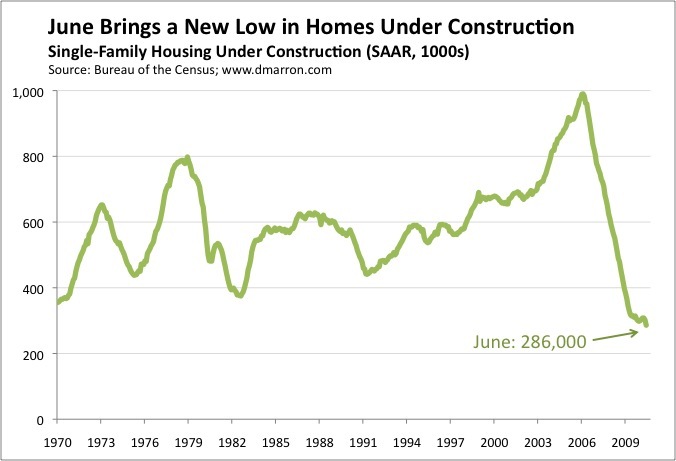 After the expiration of the new home buyer tax credit, only 286,000 single-family homes were under construction at the end of June. That’s down modestly from the 298,000 to 318,000 levels of the past year, when it looked construction was trying to put in a bottom. Just one more sign of continued weakness in housing markets. As you may have heard, the tax cuts that were originally enacted back in 2001 and 2003 are scheduled to expire at the end of the year. That notion seems rather quaint today. Congress can’t even figure out what to do with the tax code for 2010, which is already more than half over. For example, we still don’t know whether millions of Americans will be newly subject to the alternative minimum tax. We don’t know what will happen to all the “tax extenders.” And we don’t know whether Congress will really allow all estates of people who die in 2010–including George Steinbrenner–to completely avoid the estate tax (which will then return in full force at midnight on New Year’s morning). Given that record, most hope for fundamental tax reform is now focused on the President’s fiscal commission. Congress, meanwhile, is now gearing up to figure out what to do about the expiring tax cuts. On Wednesday the Senate Finance Committee held a hearing to discuss the distributional and economic growth effects of extending the tax cuts. I appeared as a witness. You can find the opening statements of Chairman Baucus and Ranking Member Grassley and testimony of the other witnesses here. You can see video of the hearing here. As you might imagine, the five witnesses didn’t always agree. There was a strong consensus, however, that our tax system needs fundamental reform. The challenge is figuring out how to do it … and do it well. During the Q&A, Doug Holtz-Eakin had one suggestion: lock the business community out of the discussion entirely. Why? Because a basic principle of tax reform will be eliminating special interest provisions and that will be easiest if business interests aren’t in the mix protecting their favorite provisions.